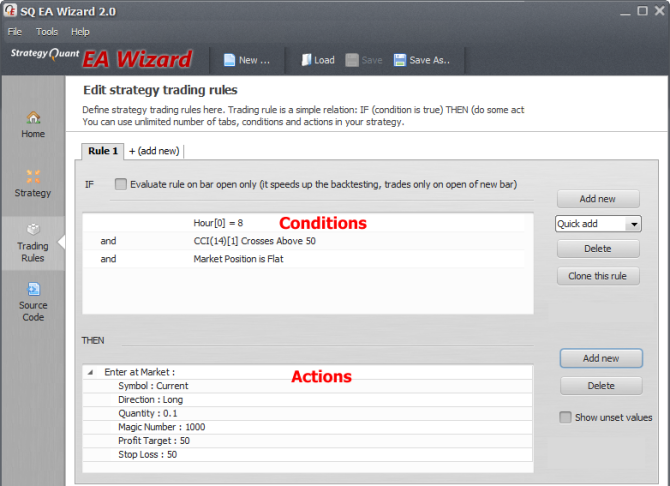 EA Wizard is a program that enables you to define your trading strategy and then transforms it into real EA for MetaTrader. Every trading startegy consists of a set of trading rules. Before you start building your EA you need to know exactly how it should trade – when it should buy or sell and when it should close the position. IF (CONDITION is True) THEN ACTION. The CONDITION can be any comparison, for example ‘CCI > 0’, or ‘EMA(10) crosses above EMA(20)’. The ACTION can be opening new order or closing an existing order. IF (Current Hour = 8 and CCI(50) > 0 and No position is open) THEN Enter at Market with Stop Loss: 50 pips and Profit Target: 50 pips. You can use unlimited number of rules, for example one rule to go long and second rule to go short. Please check the other tutorials or watch the video to get an overview how to build your trading rules. Don’t be afraid, it is very simple. When you compile your new EA in MetaTrader4, you can see a number of compilation warnings, like on the image below. This is normal, there’s nothing wrong! The warnings are there just because EA Wizard uses a library of functions that are copied to every EA, but not every EA uses all these functions. The warnings merely mean that some functions are not used and won’t be used in the compiled file.